Fathers Day is now less than 2 weeks away and I wanted to give you some ideas for gifts! Dad’s love the movies so here is a Top 10 choice of Blu Ray DVDs that anyone would be happy to receive as a gift on Father’s Day. This is one that all the family will love. Mission: Impossible–Ghost Protocol (Two-Disc Blu-ray/DVD Combo +Digital Copy) is available is $20.96 which is 53% off list price. Starring Tom Cruise this is the third in the series of Mission Impossible movies. I admit that I agreed to watch this a couple of weeks ago and didn’t have very high expectations. For me the other Mission Impossible movies were just not that great. But Mission Impossible Ghost Protocol is a really great action movie! One of my favorite of the year. Still wondering how Tom Cruise did all those stunts, particularly the one climbing up the side of the tallest building in the world! What about The Lord of the Rings: The Motion Picture Trilogy on Blu Ray ? Available for a discounted $48.99 Shipped this is a must for Dad’s who enjoy these movies. For this you get a total of 15 discs with lots of extra features! Get Iron Man [Blu-ray] for just $14.99 (and free shipping if you have Amazon Prime or Amazon Mom). This very popular Iron Man movie stars Robert Downey Jnr and Gwyneth Paltrow. It gets 4.5 Stars on Amazon with almost 1,000 reviews! John Carter is available on June 5th so time for Father’s Day. You can pre order it now and it will be shipped as soon as it is available. John Carter (Four-Disc Combo: Blu-ray 3D/Blu-ray/DVD + Digital Copy) is available with 40% off list price for $29.96 Shipped. This one was made by Disney and Andrew Stanton (the director of Finding Nemo). The budget was huge and it shows! Sherlock Holmes is also available for pre order but is released on 12th June so you will get it delivered in time for Father’s Day. Sherlock Holmes: A Game of Shadows (Blu-ray/DVD Combo + UltraViolet Digital Copy) is $24.97. This is another pre order but will be available on June 5th. Act of Valor is a fictionalized (but the reviews say incredibly realistic) account of Navy Seals in action. Act of Valor [Blu-ray] is available for $24.96. Already getting excellent reviews this is one that most Dad’s will most likely love. Have to confess that I didn’t get this movie at all (OK I was asleep within the first 20 minutes) but my husband loved it! Avatar (Two-Disc Original Theatrical Edition Blu-ray/DVD Combo) is priced at just $19.99. I wonder how many Dad’s have received a Star Wars movie as a Father’s Day gift over the years? And for good reason. If Dad is a Star Wars fan there are plenty of options for different versions and editions of the movie. 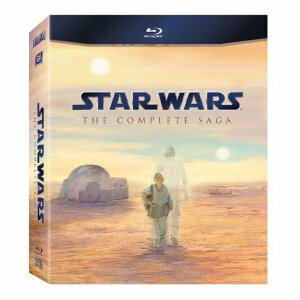 Star Wars: The Original Trilogy (Episodes IV – VI) [Blu-ray] is available for $38.74 Shipped or if you really want to get him all of the movies and tons of extra features then Star Wars: The Complete Saga (Episodes I-VI) [Blu-ray] is available for $86.90 Shipped. New B1G1 Free Gerber Graduates or NUK Coupon = Sippy Cups for just $1.25 Each! Free Reading Games for Kids!